Pleasanton, CA — December 30, 2018 — NextHome is proud to announce our newest addition to the franchise, NextHome Advisors – Bonita Springs Branch. Owned and operated by business partners, Jason Jakus and Rebecca Krueger Courson, this Bonita Springs-based brokerage will allow the company to provide residential real estate sales to entirely cover the growing real estate corridor from Fort Myers to Naples. After seeing an increase of over 53% in sales at their Fort Myers location since joining the NextHome franchise, and a successful launch of their Cape Coral office in 2016, Jakus and Krueger Courson made the decision to expand their business into Bonita Springs. “Our REALTOR® members are achieving record sales, and our office is seeing increased market share as we continue to grow. The NextHome platform allows our REALTORS® to work remotely and more efficiently, and the world-class marketing platform has increased our conversion on listing appointments from 50% to 90%. In our first year with NextHome, we took on 48% more listings than the previous year,” said Jakus. The growth of NextHome Advisors has been incredible and measurable. With increased productivity, the agents are doing on average seven transactions per year. Exceptional numbers compared to the local Multiple Listing System average of two transactions per agent, per year. Both Jakus and Krueger Courson indicated that this has been a direct reflection of the NextHome systems, marketing, and training, as well as the unique culture of support and collaboration within the NextHome Advisor’s office. NextHome Advisors currently has 42 associates servicing all areas from Fort Myers to Bonita Springs. 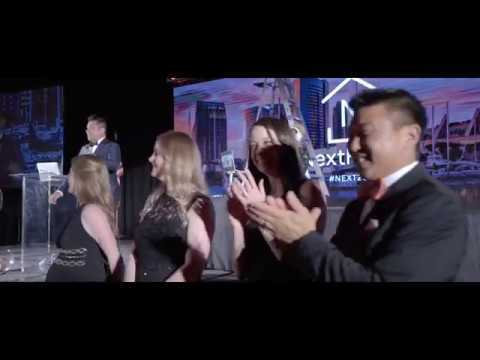 Their company has consistently been ranked as one of the top-producing brokerages in the entire national NextHome franchise. Krueger Courson began her real estate career in 2006 as a member of Leisure American Realty in Ft. Myers Beach, FL. Her sales career took off immediately due to her commitment to excellent client services, which she honed in her previous career as the Director of Operations of a resort company. “I was fortunate to have been connected with Leisure American Realty because it allowed me to gain sales experience with traditional sales, as well as new home construction, and resort and second home lifestyles,” said Krueger Courson. In 2009, Jakus joined Krueger Courson at the firm and began his career in a similar fashion. His high sales numbers were fueled by great client service and skills he gained during his former career as a business consultant and coach for Chicos clothing company. Shortly after working together at the company, Krueger-Courson and Jakus partnered to form an exceptional team, which they grew to 11 agents. While content at their brokerage, they knew they were essentially running their team as a brokerage within their brokerage. In 2013, Jakus and Krueger Courson opened Platinum Elite Realty and grew their brokerage to 20 agents. The results were exceptional. They grew to one of the top-producing brokerages in the area – consistently selling over $11 million in sales volume annually. In 2015, the brokerage was on pace to sell in excess of $16 million. While operating as a successful independent brokerage, the partners always kept open to the possibility of joining a franchise. Two colleagues who joined NextHome in 2015 – Anand Patel of NextHome Discovery and Vicky Santana of NextHome Santana Real Estate – introduced them to the NextHome franchise. While both Jakus and Krueger Courson are committed to working in the community, both have very different roles. Krueger Courson oversees the details within the brokerage, helping maintain the high integrity and value of the brokerage for their agents. Pushing productivity and keeping agents focused on their goals are her strengths. Jakus dedicates many hours to the real estate industry through leadership. In 2014, he served as the Chair for the Florida REALTORS® Business Trends and Technology committee. Additionally, he served as the President of the Greater Ft. Myers & The Beach Association of REALTORS® and Vice President for District 5 for the Florida REALTORS®. We are proud to see Jason, Rebecca and the rest of the team at NextHome Advisors open their third location! High-profile artist, producer and social media star, DJ Khaled, added another win to his list of successes with his recently purchased 12,750-square-feet Miami Beach mansion. Represented by one of our NextHomies, the hip-hop icon’s new home is the biggest transaction closed by a member of our franchise. Listed at $25.9 million, the lavish waterfront property features a total of nine bedrooms and 10.5 bathrooms—including a five-bedroom main house, four-bedroom guest house, safe room, outdoor shower, home theater, elevator, and a swimming pool nearly 80 feet long. Khaled was able to scoop up the listing for only $21.8 million. Our very own Orli Rudolph from the Rudolph & Jerry Team with NextHome Realty Professionals represented Khaled on this deal. Born in South Beach and raised in North Miami Beach, Orli has a keen awareness and unparalleled intuition of Miami’s luxury real estate market. Orli and her business partner, Matthew Jerry, joined the Ft. Lauderdale-based office in early 2017. Prior to joining NextHome Realty Professionals, the team spent five years building a client base that has resulted in hundreds of happy homeowners and lifelong friendships. Orli has a strong reputation for professionalism, commitment and has helped numerous clients invest, buy, sell and rent properties. Please join us in congratulating Orli Rudolph on closing the largest transaction thus far for our NextHome franchise! Pleasanton, CA — August 2, 2018 — NextHome is proud to announce our newest addition to the franchise, NextHome Real Estate Executives. The brokerage represents the 43rd office location opened in the state of Florida for the NextHome franchise. Owned and operated by veteran top-producing REALTOR® James Madalone, NextHome Real Estate Executives will provide real estate services such as single-family residential sales, first-time home buyers, investment properties, luxury homes and estates, vacation homes, second homes, ocean front properties, relocation, commercial properties, new construction townhouses, condos, and land deals for the cities of West Palm Beach, Delray Beach, Lake Worth, Manalapan, Boynton Beach, Jupiter, Wellington. Boca Raton, Hollywood Beach, Fort Lauderdale, and the counties of St. Lucie, Martin, Palm Beach, and Broward. James will continue to be licensed in New Jersey. The city of West Palm Beach is located 70 miles north of Miami and is home to just over 100,000 residents. Considered part of the Miami metro area, surrounding areas have a total population of approximately 5.5 million people. With over three decades in the real estate industry, James has seen his share of success. He started his career in 1988 in Central New Jersey at a small independent office. James has always been one of the top REALTORS® in the area. He has averaged a sale a week for more than 30 years – consistently ranking him in the top 1% of agents in the entire state of New Jersey. James credits his success to his consistent commitment to education and taking as many training courses as he could. Attending conferences by Les Brown, Tony Robbins, Zig Ziglar, Dale Carnegie, and many other sales and personal development coaches. Like many Northeastern residents, James and his wife also owned a property in Florida. As he moves into the broker/owner phase of his career, James and his wife, Christine, felt it was best to make the move to Florida full time to focus on NextHome Real Estate Executives. Christine holds a degree in digital marketing and will be responsible for promoting the office. She is also a licensed home stager and REALTOR®. James’ commitment to helping others is far reaching. In addition to being a top-producing REALTOR®, James has traveled the country as a motivational speaker and has taught and presented for thousands of people around the world. With talks encompassing real estate, personal development, and various other topics, he brings an unmatched enthusiasm that cannot be ignored. Please join us in congratulating James and the rest of the team at NextHome Real Estate Executives on the opening of their new NextHome office in West Palm Beach, FL!